Sometime in the fall, I received a book in the mail from Wiley Publishers, a cocktail book that immediately caught my eye. I thought it sounded like a perfect book for entertaining, and I’ve found it to be a useful addition to my bar library. 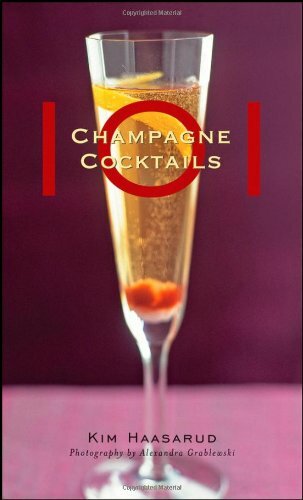 101 Champagne Cocktails by Kim Haasarud (Wiley, 2008) is a great book for home entertainers with plenty of easy recipes. The cocktails often call for fresh seasonal fruit either as garnish or an integral part of the drink, lending visual impact and fresh flavor. Haasarud is the founder of Liquid Architecture, a firm that creates signature drinks and bar concepts. Now that I’ve sampled several of her concoctions, I can claim fan status. We’ve made a number of drinks from the book and have enjoyed them all. The book has beautiful photos by Alexandra Grablewski, though not every cocktail has a photo. Haasarud included an introductory section that offers an explanation of sparkling wines and recipes for some of the ingredients she uses, including fruit purees and simple syrup. Easy recipe is easy to follow and some of the cocktails are offered as variations of a previously listed recipe. Haasarud has written several other beverage books that I look forward to trying. Visit her site for the complete list of titles. Pros: Flavorful easy recipes, lots of fresh fruit. Cons: Not for teetotalers, no suggestions for non-alcoholic versions.